In August 2018, the Tesla Model 3 became the fifth largest selling car in the United States. No mean feat even if you consider the exigent demand from Model 3 reservations not being a true representation of ongoing or current demand. But if we do treat the Model 3 as one of the best-selling light passenger vehicles in the U.S., then we have to look at the impact that a $35,000 Model 3 will have on the U.S. auto market. The current variants of Model 3 are priced upwards of $49,000 without counting incentives or gas savings. Factor those elements in and the Model 3 Long Range RWD already costs less than $35,000 in states like Colorado. But a $35,000 Model 3 PLUS incentives and savings will be squarely in the price bracket of the Top 4 sellers – Toyota’s Camry and Corolla, and Honda’s Accord and Civic. We already know that people are trading in much cheaper ICEs and even EVs like the Nissan Leaf for a Model 3, so what might happen if the Model 3 with Standard Battery were to be pitted against the sales-wise giants of U.S. auto? Havoc, to say the least. In fact, don’t be surprised if you see the standard range Model 3 at the very top of the best-seller list the same month that it is released. The delay is not because of any technical limitations because it’s just a question of putting in a smaller battery in place of the 75 kWh packs that all the other variants have. Of course, we’ll have to consider battery production levels for the new 50 kWh batteries, as well as whatever system and software tweaks are required for the lower-powered batteries. But that’s about it. The real reason Tesla hasn’t released them yet is profitability. Until the company can safely negotiate Q3 and Q4 as a cash-flow positive Tesla, Inc., there’s no point in cutting margins and suffering the slingshots of analysts and investors. It’s a smart move because the current variants give them the buffer to become profitable over the next two quarters, while the Model 3 SR offers a promise of massive volume. Win-Win. For Tesla and Musk, that is. Depending on how quickly Tesla is able to produce the standard range battery versions of the Model 3, it will help them rapidly scale up the sales ladder and push both Toyota and Honda out of the way. At least, until reservations are depleted and the Model 3 has to stand on its own merit in an aggressive auto market. All of this needs to happen in the first half of 2019 if Tesla wants to take advantage of the massive production momentum that they’ve built over the past two quarters and continue to build in Q3. 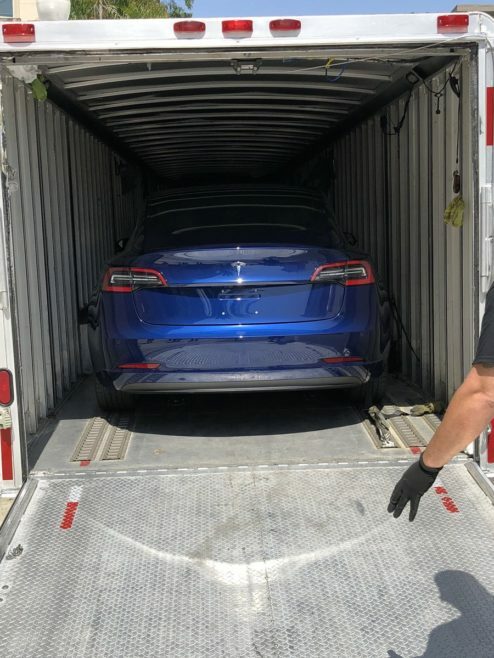 Musk recently told his employees that the company will be more than doubling both production and deliveries, but he (deliberately?) wasn’t clear whether it was overall numbers or just Model 3. Either way, we’re looking at a record quarter for the Model 3, and along with it the company could end up posting a modest profit and keep its promise to investors to be cash flow positive moving forward.